Author: Wilhelm J.G. Möhlig, Karl Peter Shiyaka-Mberema. Series edited by: Axel Fleisch, Wilhelm J.G. Möhlig. 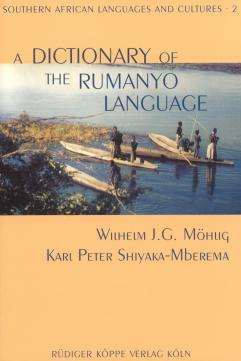 The Bantu language Rumanyo (K.70) is spoken in two dialectal variants – Rushambyu and Rugciriku – on both sides of the middle Kavango River in the northern part of Namibia. Approximately 120,000 people speak this tone language. It is used as medium at the local schools and in the educational literature, and it is supraregionally broadcasted through the Kavango Radio. The intellectuals of the politico-cultural active class write belletristic literature in their native language, and they are getting more and more in evidence in the national context of Namibia. In the year 1965 Möhlig collected a list of words with 2,000 entries in Rugciriku, French, and German, 1967 he wrote a grammatical sketch in German. The South African apartheid government standardized the Rumanyo orthography in 1988. This was an essential precondition for the dictionary, which can therefore also be used by the native population. The authors succeeded in compiling a dictionary with 10,000 keywords in close cooperation with native experts – especially with the school inspector Karl Peter Shiyaka-Mberema. The book is divided into three parts. The main part includes the Rumanyo-English wordlist with exhaustive information about every entry concerning grammar, syntax and semantics. The tonal rules for the context bound usage are marked graphically for every word, too. In addition cross references show derivations as well as word formations. The second part consists of the wordlist English-Rumanyo. At the end of this book the reader finds a grammatical sketch. In this chapter the separate information parts of the dictionary are established a systematic correlation. The dictionary has a very clear and coherent structure. The entries contain some examples and phrases, but not too many. Some are accompanied by an additional syntactical information. With an exhaustive grammatical information to each entry, the grammar notes and a clear and cogent composition the dictionary makes of it a very user-friendly piece of work, not to mention its very inviting cover.